← ARE YOUR EYES TOO BIG? The word masquerade can be used to describe a false outward show or façade, pretense, or a hypocrite’s masquerade of virtue. 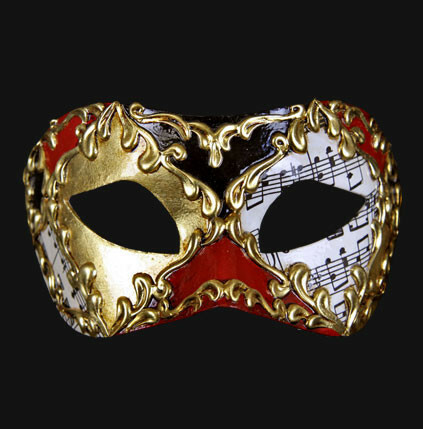 Perhaps you may have attended a masquerade party where people dressed up wearing masks (false faces) and costumes which conceal who they really are. And, sadly enough, we often fail to see the masquerade that takes place in ministry . . .
Mary and Martha were both serving their Lord. They were making preparations to receive Jesus and His disciples for a time of food and fellowship. Mary knew when to exchange her service for sitting at the feet of Jesus; Martha, on the other hand, did not. Yes, Martha was serving the Lord, but her service had taken the place of her Savior. It is so easy to be busily satisfying the needs of self while simultaneously masquerading as a sold-out servant for our Savior! If you are a regular follower of this blog or a member of Cross Community Church, you are familiar with this statement: Good things become bad things when they become ultimate things! God gives us so many good things to enjoy in life—from family to friendship, money to ministry. But when we take any of the good gifts God has given to us and make them into ultimate gifts in our minds, they have become bad gifts that turn our affections away from God. How do we keep this from happening—not only in ministry, but in every area of life? Here is the key that unlocks the door to authenticity in all our activities: seeking first the kingdom of Christ and His righteousness. Jesus must be our first priority. He is to sit upon the throne of our lives. He is to be the Alpha and the Omega of everything we do—our first thought and our last thought. When we are more focused on our Savior, we are less focused on ourselves. When our Savior—not our service to our Savior—is truly our highest priority, then our service will be pleasing and acceptable in His sight and will also meet us in our deepest place of need. So . . . are there any areas in your life that are masquerading as something other than what they truly are? When Jesus becomes a means to an end—any end—we miss the most important aspect of our calling. At this level of living, we don’t find our satisfaction in loving Jesus, but rather in what we get by serving Him. Yes, we love Jesus, but we love the stuff we get from Him just as much . . . if not more. It is only when we have our priorities in order as Mary did, who knew her Savior was always more important than her service, that we will be able to rise above the masquerade and rest in our Master.